On Thursday, December the 8th, the 90 selected seniors of Williamsburg High School for Architecture and Design traveled the intricate subway systems of Brooklyn and Manhattan to experience and art installation at the Park Avenue Armory. 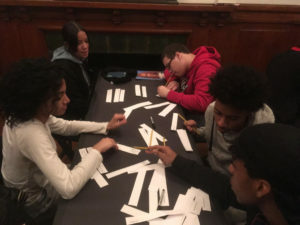 Manifesto was the culminating trip for the senior cohort that was led up to by four, in-class visitations of two of the Armory’s Resident Teaching Artists, Vicki Tanner and Neil Pritchard. Upon arriving to the Armory, the students were separated into five groups. In these groups, they discussed the manifestos that they created in class and they were prepped to view the installment that consisted of twelve 20×20 projections of Kate Blanchett portraying twelve different Manifestos written by 19th Century thinkers. The manifestos, which challenged the students’ views on art, the individual, society, and their personal thoughts, left some students feeling quite moved by the experience. Every trip made to the Park Avenue Armory leaves the students, and teachers alike, discussing the installation during the days that follow.